Baghdad is still reeling from a sustained air assault by coalition forces, in which the US says more than 1,000 cruise missiles were fired at the Iraqi capital in 24 hours. Fires still smouldered in the streets on Saturday after the overnight bombardment. And now plumes of smoke are rising above Baghdad from six or seven points on the horizon, possibly pools of oil and fuel being lit around the city as a defensive measure by the Iraqis, BBC correspondent Paul Wood in Baghdad says. Air raid sirens wailed and ambulances have been racing through the streets to tend to those injured, struggling to drive over debris from shattered buildings. Workers could be seen clearing rubble from the city's roads, as well as glass shattered by the force of explosions from coalition bombs, French news agency AFP reported. Subhy Haddad, a BBC World Service reporter who lives in Baghdad with his wife and children, described the noise of the attack as immense. "The attacks were all around our place," he told BBC News Online. "The windows were shaking and the doors were slamming shut because of the pressure from the falling missiles." 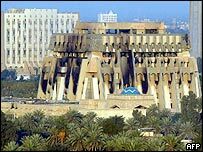 The burned-out shells of Iraqi government buildings in the centre of the city were testament to the ferocity of the firepower unleashed by coalition forces. Subhy Haddad said that his children, although frightened by the noise, were slowly becoming used to the bombing, although that did not make the situation much easier. "My eldest daughter, she is vigilant, she knows what the bombardment means," he said. "But she couldn't sleep so my wife had to give her a pill." Traffic was still visible through the streets early on Saturday morning, lights and phones in buildings were still working and Iraqi television was also continuing its broadcast of patriotic songs. There were signs that the city's defences were being reinforced and that soldiers were being deployed in residential areas. On Saturday Iraq saw bombing during the day for the first time, a development which our correspondent says has unnerved the city. "It is very worrying to the normal citizens, who are trying to take some rest during the day after being awake in fear all night," he said. "It is something really horrifying to them." 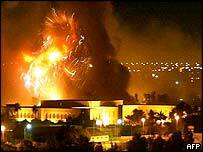 "This afternoon Baghdad was shrouded by black smoke"